I would like a configurable clock where you can choose numbers sizes and typo. In analog mode be able to setup 12 or 24h sphere. And in a 24h setup have local night and day (sunrise and sundown), and moon up/down, also be able to setup the day sphere in hours plus beats (1000 beats a day) plus the GMT time in beats and / or time format, or instead of GMT (GMT+x) if you have relations with some place far away. Also be able to put some weather variables inside for at least 2 places, as temperature, humidity, and wind, and even sea waves if you are a sailor or a surfer. So, if you want in a very small space, with a look, have all the weather information, your time, some abroad or far away time, the day in %, sun and moon cycle, and some other information you can add perhaps with some html plugins window, in a RSS rollup style for G+ or google news headlines, or your e- mail headlines or your main inbox headlines for gmail. And with some fancy presets able to be downloaded, with a google ad version and perhaps a pay one. 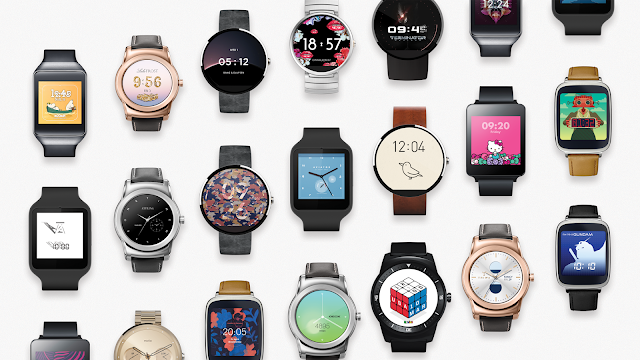 I think you could do all of that with some of the watch face apps already available, such as WatchMaker or Facer. Man, some of these watch faces are ugly. I feel like Google should be protecting users by reviewing watch faces before they are made available to the public to ruin people's lives. Oh, I guess that's not "open." This whole thing reminds me applying a skin to MySpace. Protect users from ugly designs ? If you want Jonathan Ive to pick face designs for you , get yourself an apple watch. @warmi: "If you want Jonathan Ive to pick face designs for you , get yourself an apple watch." You act like it is an either/or situation. It isn't. Ever since the update, my 360 keeps saying "Unfortunately, Android Wear has stopped" I can't use any functions. Anyone else having the same issue? Nothing says elegant like simulating chrome. They look like cheap toys from the cereal box. Thanks for your reply I am always trying to make my phone work it's best.